The Boiling Lake in Dominica is located in the Morne Trois Pitons National Park which is considered as Dominica’s World Heritage site. 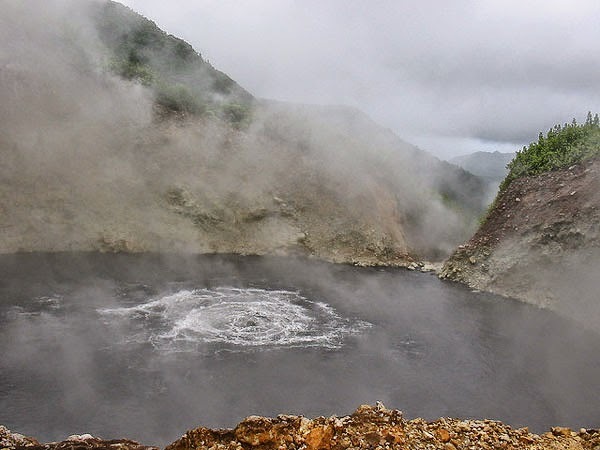 Located in Dominica, it is a beautiful Caribbean island and is the second largest natural hot spring on earth.The lake’s cool outer areas maintains temperatures which are between 180 and 197 degrees Fahrenheit and no one till date has made any attempt to measure the temperature at the centre of the lake which seems to be actively boiling. The lake is around 200 feet to 250 feet across and the recorded depth is said to be greater than 195 feet.It rests at the bottom of a huge sinkhole type of a basin and is a flooded fumarole which has an opening, hole or a crack in the earth’s crust within the area of a volcano that emits steam and gas from molten lava below. Presently this lake can only be viewed from a broad, cliff-top ledge which is around 100 feet above its shore. It has high rocks that surround it, creating the basin. The lake is filled with bubbling greyish blue water which is enveloped in a cloud of vapour. The basin’s water is filled with rainfall with two other small streams which drain in the area where the water seeps in the lava and gets heated to the boiling point. The first records of the lake by Mr Watt and Dr Nicholls, two Englishmen who had been working at that time, were in 1870. Mr H. Prestoe, a government botanist together with Dr Nicholls was commissioned in 1875 to investigate this natural phenomenon wherein they measured the water temperature, finding it in the range of 180-197 degree F. all along the edge though could not measure the temperature at the centre which was actively boiling as portrayed in photographs taken at the site. Moreover, the temperature cannot be controlled due to the cracking in the lake bed through which molten lava erupts. The Boiling Lake is a unique natural phenomenon and the largest of its kind in the world after Rotorua in New Zealand’s north island. The way to reach this site is on foot, where the trail from the village of Laudat covers an area of approx. 7 miles which should not be attempted without the guidance of an experienced guide. The hike comprises of 3 hours either way to complete, with trail climbs and descends done through forested highland through Titou Gorge, Breakfast River, Panorama viewpoint as well as the Valley of Desolation where one comes across steam and boiling water surfacing through various vents. The steaming Boiling Lake can be seen from a distance. The trail also leads to another volcanic area known as the Valley of Desolation where the air around the area seems to be hot, steamy and moist with a sharp acrid smell of sulphur. The area is also know be filled with vapours and gases which escapes from the bubbling sulphur water, small sprays and hissing geysers, cracks and holes as well as from the small stream which runs through and below the terrain. It is said that the tiny invisible sprays of steam could also burn an ankle or foot, easily.